Last month I was blessed to be able to serve my parents for three weeks while Mom recuperated from a broken clavicle and leg. During that time, Mom said she would like a small table to set beside her recliner. Since Dad doesn’t have many woodworking tools, I made her an extremely temporary “table” from a 10” x 18” piece of hard maple and a short piece of 2” x 6” stacked on a small metal plant stand. 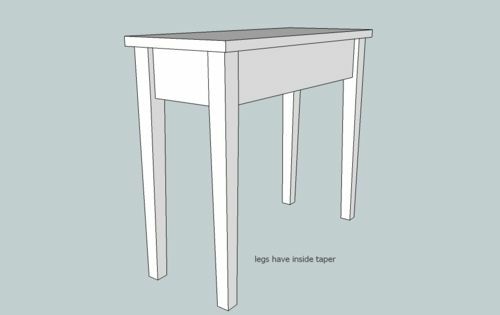 While I had access to high-speed internet at their home, I downloaded the new version of SketchUp and designed this very simple table for Mom. The 4/4 oak was milled off our property. 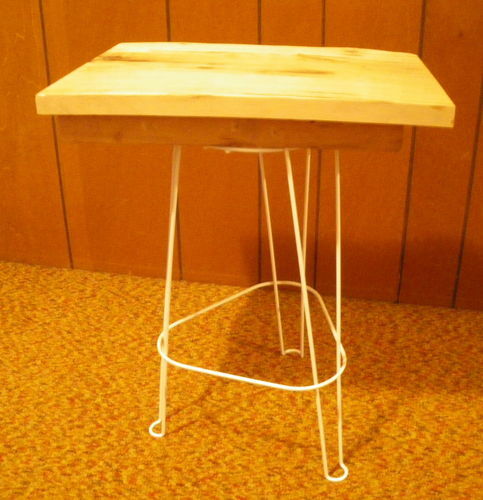 The legs were made from 8/4 oak (sold as 2” x 6” x 8’ studs for $2.00 each). I had to purchase hinges since I didn’t have any that were small enough, but sufficiently heavy for the top. The two hinges were 31 cents with tax! It ended up being a pretty economical table! When I got back to my shop, I wanted to get it done quickly so I really pushed myself and finished it (and my brother's tray table) in about two weeks. The slowest part was drying varnish with a week of rain and high temperatures in the 50s! I inscribed it on the inside with a note to Mom and on the bottom with my name (just in case it lasts more than a generation)! I haven’t woodburned much since my teen years (which was a couple of years ago) and I just couldn’t seem to follow a line on that cheap lauan plywood, so I ended up free-handing the lettering. Even though there is nothing special about the table, it seems to fill her need so I consider the project a success! Thanks for taking a look. Excellent job, and the inscription is a great touch. It looks great from here…nice size , Oak grain and color and totally functional to boot ! Another superb project. You certainly have a knack for designing functional and beautiful furniture. Your speed is impressive too. How long have you been seriously interested in wood working? Very nice, Two tables in one. You have been a very busy Lady. Very nice Craftsmanship! Bently, I even managed to figure out a little sled to run the legs through the drum sander after I tapered them on the TS. It sure beat hand sanding and it was a lot more uniform as well. Mom is doing remarkably well—thanks for asking. We helped them with a few more things this week and will be heading back home again so they’ll be on their own. Your first one was ingenious. I’ve alwys liked the straight line design in furniture, but while they look simple, it can be demanding to make in terms of accuracy and attention to detail. You did good, LWLL! Very nice table, it even flips open. She’s gonna love it! What did you do with the temporary one? Just courious. I’m glad your mom is doing good too! Trevor, Mom just got rid of the piano to my youngest sister less than a year ago (downsizing finally at age 92). I have the other piano we had as kids which was my very first venture in furniture stripping when I was a young teenager. It’s a 1926 Howard grand that had a black laquer finish that had crackled. I stripped it and my dad helped me sand it. After all the strings started breaking, they got another piano and moved the grand into the garage. When I had a house fire some years later and lost my Everett, I “inherited” the Howard and had it rebuilt. Mom probably doesn’t want another piano around (since she never learned how to play, but I certainly do miss having one when I’m there for more than a couple of days)! As slow as I am, Mom would be 130 before I got it done . . . IF I had that kind of talent! And, by the way, the table was extremely comfortable as a bench ;-) ! Thanks for the nice compliment. Your woodturning far exceeds any skill I will ever hope to have! It is simple but lovely. Its finish is warm and natural.